David Kerwood Construction have carried out numerous new build projects over our 17 year history. Although we are a specialist listed/historical building contractor, we are easily capable of meeting the requirements of modern day construction. Past projects have included the building of new offices sympathetic to a rural setting; new houses using a variety of traditional and contemporary materials; steel framed agricultural and equine property. We have the facilities to design, project manage and build to any specifications, controlling a project entirely from conception to completion. A new brick and flint house in landscaped grounds with triple garage. 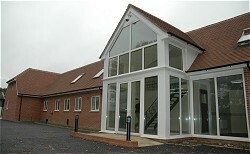 A new modern office and staff accomodation designed and built by DKC.